You can build a potent gaming PC around a micro-ATX or even a mini-ITX foundation with today's hardware. Finding powerful parts for small form factor systems isn't all that difficult nowadays, but the cooling that can be a challenge. To help with that aspect, Thermalright announced a pair of new high-end CPU coolers designed for smaller systems. The first of the two is the AXP-100RH. This is a low profile cooler "designed for users who are looking for maximum cooling capacity at minimal dimensions." Compared to its predecessor, the AXP-100R, the newer model measures 7mm taller at 65mm. Thermalright says the added height is so the cooler does not interfere with the higher VRMs on the most recent Asus ROG Maximus motherboards. It has a dominating presence at 108mm long by 121mm wide, though it does not get in the way of the graphics card or RAM. There are half a dozen 6mm nickel plated heat pipes that snake through the aluminum block, which has 40 fins. 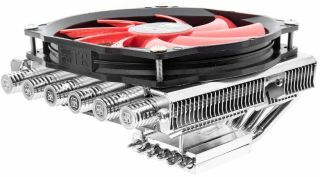 Thermalright also points out that the AXP-100RH makes use of a T-shaped down draft cooler design that pushes air flow perpendicular to the motherboard where it can cool surrounding components. "This way the voltage converter, memory banks, and chipset can be effectively cooled under ideal circumstances," Thermalright says. The other cooler Thermalright announced is the Silver Arrow ITX-R. At 153mm x 103mm x 150mm (LxWxH), it is more compact than its predecessor, the Silver Arrow ITX. This allows it to fit into a wider range of mini-ITX cases, though Thermalright says it's also an effective CPU cooler for micro-ATX and standard ATX builds. Like the AXP-100RH, Thermalright had Asus ROG mini-ITX motherboards in mind when designing the Silver Arrow ITX-R. According to Thermalright, users do not need to worry about the cooler getting in the way of memory modules or graphics cards when using with an Asus ROG motherboard. The cooler features a high-gloss nickel plating finish with a fan sandwiched between two cooling towers. It also has six 6mm copper heat pipes. Thermalright has set the MSRPs at €50 for the AXP-100RH and €75 for the Silver Arrow ITX-R. Both will be available in March.